The GP2200i inverter generator provides outdoor enthusiasts with a portable power solution designed for a variety of open-air festivities. From weekends in the woods to outdoor cookouts and get-togethers, these models provide the stable power you need without disturbing neighbors or surrounding wildlife. Using TruePower™ Technology, the GP2200i produces the clean power required by a variety of sensitive electronics, tools and appliances. Compact and fully-enclosed, its lightweight design makes transportation easy, and its Economy mode feature also reduces fuel consumption rates and noise emissions to operate quietly for extended periods of time. Whether you’re tailgating for the big game or simply want to enhance your campsite experience without disrupting the environment around you, Generac’s GP2200i inverter generator is right for you. An affordable solution for recreational applications, the GP2200i is the perfect size for tailgating,camping and power on the go. Its innovative paralleling capability allows you to meet higher output requirements by connecting two GP2200i models together to power your RV air conditioner, lights, cell phone chargers, and other portable appliances at the same time. The easy access storage compartment in the back keeps power cables safe when not in use. Rated 5 out of 5 by Ej2003 from So far this generator does everything I needed to do and is very quiet So far everything I’ve tested the generator and has worked flawlessly from running shop lights to small hand tools. I would definitely recommend this generator because of its quietness. Thanks for an easy to use product . Rated 5 out of 5 by LOWfisherman1 from Awesome Generator We purchased one of these for our son to use in his bow fishing boat used it all last summer with no issues. We brought it with us up to Lake of the Woods on an ice fishing trip. Temperatures were -25 to -35 degrees below zero. Not one issue. Took it on our next trip to same lake a couple of weeks later. Temps were even colder. This thing purred like a kitten. We have since used thos generator for 4 trips up to the big lake. It runs for 4 days straight on each trip. Not even 1 hiccup Excellent product. Have since purchased one for ourselves so my son could have his back. Also, quieter than the Honda. 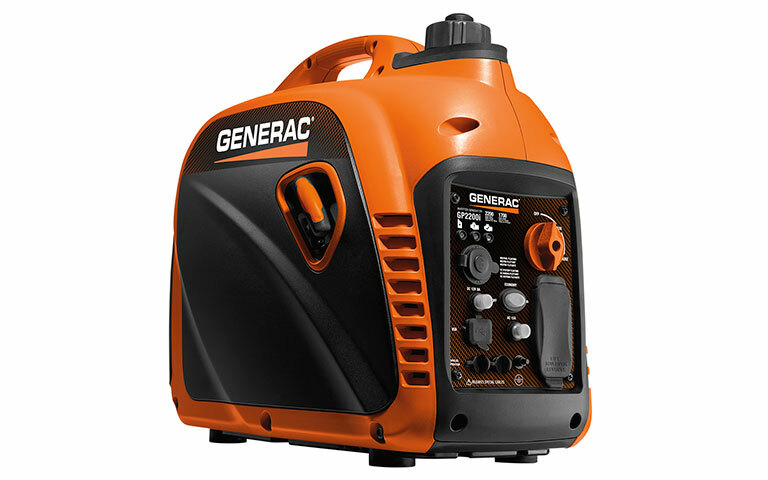 Rated 5 out of 5 by Bigheaddog1 from Great value on a great product I own a generac 20kw standby and a Honda 2000 watt portable. Now I have a Generac GP2200i. It does everything the Honda does and is just as quiet for half the price. Don't pay more for the Honda. Rated 5 out of 5 by ry from Great for HVAC work I purchased this because i need to be able to run my vacuum pump after installing a a/c unit on a new construction job. works great!! Rated 5 out of 5 by ongenerachigh from A must have I purchased this portable for use with my ice house instead of my large 1998 Generac 5000 watt which was overkill though, "If you own it use it" thought process. Oil and gas were added for a quick test run prior to it's first fishing trip. Two pulls and this unit was off and running great. My personal experience is one of complete satisfaction especially when this unit ran for 8-1/2 hours on one tank of gas on economy setting and responded to load instantly when needed. Quiet operation, efficient, and thus far very dependable. Generac, thanks for providing great power products! Rated 5 out of 5 by BC from Good Generators Bought two GP2200i to parallel to run camper. Both ran great out of the box. I expect dependable performance from Generac. As with all small engines, I use Nonethanol fuel and drain the float bowl after use. Rated 1 out of 5 by Terri from Won't start Received from shipper. Won't pull. Called customer service and they tell me to remove and reseat spark plug. Still won't pull. Local dealer won't do warranty work on it. Now, generator that doesn't even start sits in the garage and we have to buy another to use in our time frame. Hope I can return the first one! Rated 5 out of 5 by Bob from Does the job Between hurricanes and ice storms, we have power outages about 4 times a year that last longer than 8 hours. I bought this inverter for one reason: to power our freezer!! Does the job and even gives me a lamp or two when it is dark. GP2200i is rated 4.7 out of 5 by 52.